Update, September 2, 2018:This post still gets a lot of page views but is quite old. The majority of recipes developed from this earlier information are now available on my Flint Coney Resource Site. Yes, I’m back on the subject of coney sauce again. It’s an obsession. Having made 72 batches of my own recipe for a Flint-style coney sauce over the summer of 2008, you’d think I was tired of it. But Monday as dad’s funeral procession headed north through Flint along Dort Hwy at Davison Rd., I found myself looking west. Yeah, Angelo’s is down that way … dad really liked it … I wonder if they’re finally making the right Flint sauce once again … The funeral director seemed to think the family had bought back the restaurant which they had sold without selling the recipe, and may actually be making the original sauce in the original location once again. I guess at some point I’m going to have to find out what’s going on up there. For a long time the realities of Michigan’s coney sauces, including the beloved Flint coney sauce from Angelo’s, have been a bit elusive to some extent. The recipe for the sauce I served this past summer is based on the popular rumor of, “I always heard there were ground Koegel Viennas in the Flint sauce”. That’s what we did, and the sauce was something our customers really liked. But there is something else as well. There are a couple rumors I’d heard that have made me wonder about the real recipe. One of the rumors I’d heard was that there weren’t hot dogs in the original Flint coney sauce. Rather, it was organ meat. I’d also heard rumors that if you use tomato sauce in the coney sauce (which I always have), that’s not authentic either. If you click on this image to open a larger version of the image, and have a look at the ingredients, you’ll see something interesting: Beef hearts. Suet. Cracker meal for thickening. Some spices including paprika. A little bit of coloring. But not a single drop of tomato anything in there whatsoever. Brown the meat in the vegetable oil but do not drain it. Once it’s browned, add the spices. Also add just enough water to moisten the sauce, maybe a few tablespoons. Simmer the sauce for 30 minutes, stirring occasionally, until it’s somewhat dryer, while being careful not to let it dry completely. Served over grilled hot dogs having natural casings (Koegel Viennas). Mustard and finely chopped onion are the preferred toppings. Brown the beef heart and ground chuck in the suet but do not drain it. Once it’s browned, add the water and the spices. Simmer the sauce for 30 minutes, stirring occasionally and adding more water if necessary to keep it wet. Once the sauce is simmered, add the cracker meal to tighten it up but not too much. 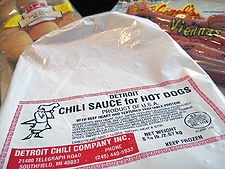 Served over grilled hot dogs having natural casings (Dearborn Brand). Mustard and finely chopped onon are the preferred toppings. So what about the Flint sauce? Does it contain organ meats or not? The fact is there is no regulation on what goes into a hot dog and some do contain organ meats. If the Flint coney sauce does contain ground Koegel Viennas as mine did this past summer, there’s just good beef and pork in there. If they’re using cheaper hot dogs, there just might be some organs. But at the same time, neither the Jackson nor the Detroit sauces contain ground hot dogs. And while the Flint sauce is dryer than these other two, what Angelo’s created in 1949 may have contained organ meats which were in popular use at the time. In a small pot melt the rendered beef suet or lard. In a large mixing bowl mix all but the salt and pepper by hand. Gently crumble the meat mixture into a medium pot, add the melted fat and stir well. Set for low heat and allow the pot to heat up. Simmer over low heat for about 45 minutes, adding suet or lard as necessary to prevent the meat from drying out. When the simmer is done, add salt and pepper to taste and finish stirring. Served over grilled hot dogs having natural casings (Koegel Viennas). Mustard and finely chopped onion are the preferred toppings. I do know where I can likely get the beef kidney, beef heart and real suet. Once we try this, I’ll give a full review. I’m in Eau Claire WI. Whenever I travel east, and/or the return, I make sure to purchase two or three dogs, as well as frozen sauce, which lasts until I return to Eau Claire). I’ve been eating these dogs since the 1950s, in intermediate school. I get them at Virginia Lunch, although I’m told the original sauce is still closest to tthat of Jackson Coney Island, just down the street. Recently, I had the sauce shipped ro me in WI. Everything is as it was–absolutely delicious!! Shipping the sauce is best done in the colder months, and I paid more for the shipping than the sauce, but it was worth 8t. Does anyone know which recipe is the closest to the one used at the Bay City location? I grew up eating there and my kids loved those dogs too. 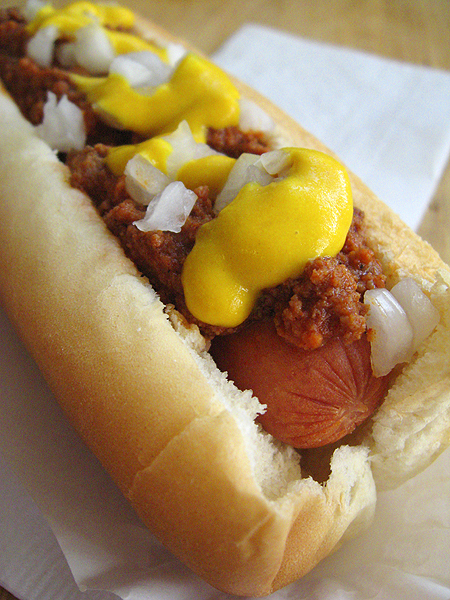 We all live in Seattle now and would love to have true coney dogs again.